If you live in or somewhere around Brabant and you’re a real dnb head you’ve probably heard about NOX before. 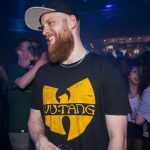 The young organisation has been really active since 2017 and over the last few years, they’ve managed to throw some of the best drum and bass events in their area. I always hear so many good things about their nights, but somehow I’ve never managed to visit one, yet. Shame on me, right?! Naturally, I wasn’t surprised last week when I read about how they’re stepping up their game next August 16th organising a festival for the first time. Let me tell you, this is going to be a big thing. NOX in the Woods Festival is going to be a wonderful journey through the woods of Eindhoven, full of music from a wide spectrum of (drum and) bass music in a wicked green environment. To be more precise, the festival takes place in the Philips de Jongh Wandelpark which is fairly close to the Eindhoven Strijp-S train station. And also: the festival is not only about music, but there’s plenty of other things to explore, for instance, multiple tasty food trucks with all kinds of food. Nice one! Apart from all of this, there’s not a lot of info available in terms of the line-up right now, although today Etherwood got announced. That’s a great start, to be honest! Anyway, closely watch their Facebook event in the coming weeks as NOX will be announcing their line-up bit by bit. Tickets are up for sale already, early birds go for just €25 right now. I’m excited to see how this event will evolve as I know for certain that NOX always delivers. So if you don’t want to miss out: don’t sleep on this and get those early birds before it’s too late!